If you want to talk about a mutant power that is really cool in thought, we have Angel! Why is that you say? He has wings! He can fly! His body is mutated for the idea of flight! Basically as humans, we aren't meant to fly. There are a lot of factors as to why(I'm no expert so I won't try to sound like one) we can't but Angel's mutant genes gave him those perks to give him flight and to handle wings. It's cool, right? No, not really because… well we have villains who can fly and shoot out beams out of their whatever. So flight is cool but he is pretty useless against a lot of enemies! But as a figure, I have to say, this is Toybiz still demonstrating that they were damn good and Legendary material! And yes, this box wouldn't stand so I had to resort to lying him down! It's in his wing that we get the most impressive look on the paint detail, the sculpting, and just over all what Toybiz was about. I mean there is a new Angel coming out for Hasbro for the original X-Men and from the pics I have seen his wings is NOTHING like this one(I could be wrong). As you can tell I had to separate my usual collage because his wingspan is HUGE. Cutting this pic into the others wouldn't have gotten the point across that his wings are majestically sculpted, painted, and given some great amount of thought! His wings MAKE the figure! As you can tell a stand is a must for him. Not only is he a flier but his wings makes him pretty heavy, so that is the downside of having such a perk. I'm not going to complain that much since the stand is durable enough to stabilize Angel. 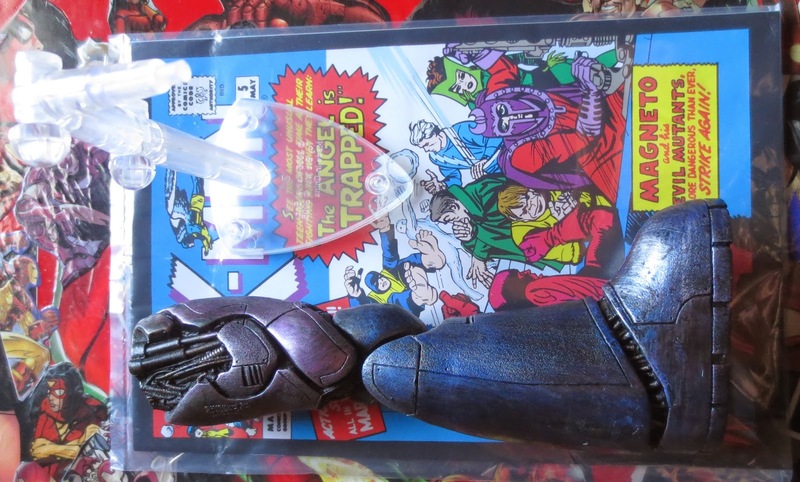 Oh yes, a Sentinel boot and a pretty aged comic book comes with Angel. Missing the ankle pivot, Angel is a great articulated figure. Pretty standard mold with lots to offer in terms of articulation. I didn't find myself posing him too much into acrobatic poses or whatsoever because of the wings making some pics look awkward. The one thing is that the stand sometimes falls too short to truly magnify his flight capability, but there are ways to go about making his flight more believable. I'm going to get an Archangel toy one day and preferably the ones from Hasbro, but judging right now, this is a great testament of Toybiz Legendary glory. Again as a figure he isn't astonishing but the detail on his wings makes him really worth it. Yes he comes with a Sentinel piece, but this guy really took me by surprise with how cool he is with those wings. Pretty impressive! Glad to have him on my collection!